This petite silver pendant is a functioning kaleidoscope made with sea glass and recycled glass. How often do you find a piece of jewelry that not only makes you look beautiful, but also gives you a new way of looking at the world? 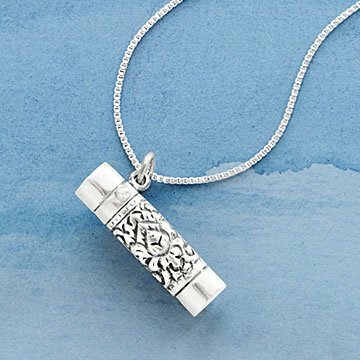 Take a close look at Kevin and Deborah Healy's elegant silver column pendant, and you'll discover it is actually a miniature, fully functioning kaleidoscope. The handcrafted little wonder has three mirrored surfaces inside that reflect a shifting tapestry of vibrant colors, provided by tiny grains of sea glass and recycled glass. Simply hold the rotating silver band between two fingers as you turn the tube and peer inside at the snowflake-like patterns within. The exterior of the pendant is embossed with an intricate lotus pattern. Each is engraved with the initials of the artists and the year it was made. Hangs from a sterling silver chain. Handmade in the USA. I can't believe I found this!!! YEARS ago my family wen't to a festival in California. We saw these there and each got one because they are beautiful! I still wear mine all the time. Then I'm looking through here and found it! It is still our favorite and we love it! I was excited to receive this necklace. While it worked, I was thrilled with it. However, that was short lived. Now, it shows no color and it's cloudy. Works so well for something so tiny! Got this for my wife and she absolutely loves it! Beautiful and interesting. Well made. Kalaidescope really works! In love with this necklace! This is very pretty and very petite. My friend seemed to like it. Sh was surprised it is a working kaleidoscope. So much better than I ever thought it could be! As a necklace, this is already quite beautiful. But I was astonished at how good it is as a kaleidoscope! I thought, given its small size, that the colors and patterns would be quite simple - but they are *wonderful*! Now that I've bought one for my daughter-in-law, I'm hinting rather shamelessly to my husband to get one for me on *my* birthday! Kept looking at this necklace because I love miniatures and kaleidoscopes. Finally treated myself. The kaleidoscope works well, having many colors and the necklace is so unique and pretty! So pleased I purchased this and so happy someone thought to create this piece!